Product DescriptionI. rice manufacturing line descriptionThe rice manufacturing line is order to improve broken rice's value,mill the broken rice into rice powder, and then we make it into nice outlook,brightly, realistic riceThis process line is studied in concern with the loss of nutritional elements in the rice which is made by the traditional rice processing. Rice and it's by-products can be produced into highly nutritional foods by adding additional nutrient components after extrusion cooking. Further, for this process, the broken rice and rice bran can be reused. Process for making artificial rice grains,comprises a mixture of rice flour,water and oil in the extruder, forming into rice-grain shape,drying and cooling in low temperature.The technology makes it feasible to avoid the loss of nutrition.II. rice manufacturing line feature1. Raw material: Rice, millet, black riceand all kinds of corns and cereals . 2.Capacity of the rice manufacturing line : 120kg/h to 550kg/h . 3. rice manufacturing line materials: stainless steel and mild steel . The screw length is up to 1400mm, increasing compression and melting length than traditional 1000mm screw. EXT100, output :100kg/h-150kg/h. Main machine power is 30kw. Three phases: 380V/50Hz, Single phase: 220V/50Hz, we can make it according tocustomers’ Local voltage according to different countries. Since the establishment of our company, we have always manufacturing our machines according to the authorized standards, by now ,we have got several certificates including CE and ISO9001 and etc. We are professional manufacturer of food extruder and mainly deal with the manufacture, research and development of the inflating food machine. According to the clients’ different requirements, we could offer the whole complete processing line for all kinds of expanded snacks, corn flakes, nutrition powder, and pet food and so on. Our technical assistance will help clients produce high quality products all the time. Depending on our rich experience and professional experts on the extruded food industry, we could offer the most suitable and complete program to assure that your investment will get biggest profit. Our machines are exported to more than 90 countries and areas and got high praise of customers. Some of them have become our agents in their area. We hope to hold long friendly business relationship with more clients all over the world in the future. 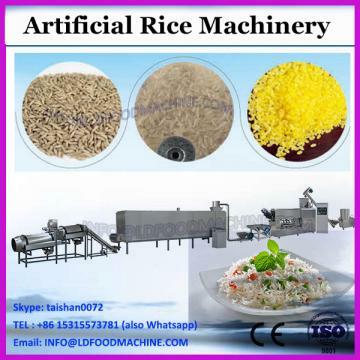 High quality rice manufacturing line, artificial rice making machine, tice production line is a kind of breakfast with high nutritional value. usually use corn powder and other cereals as main raw material, through mixing, extruding, drying, baking, coating and cooling, to get crispy flakes. High quality rice manufacturing line, artificial rice making machine, tice production line always service as breakfast cereal mixed with milk of coffee. But High quality rice manufacturing line, artificial rice making machine, tice production line can also be a kind of leisure snacks. can also make other shapes of cereals such as rings, balls, chocos, curls etc. has adopted technology from America. High quality rice manufacturing line, artificial rice making machine, tice production line take corn flour as main raw material,High quality rice manufacturing line, artificial rice making machine, tice production line's is very crispy after extruding,granulating,flaking, frying,seasoning. The outstanding characteristic of flakes is co-ntaining abundant compound carbohydrate and dietary fiber.Jinan Joysun Machinery Co., Ltd. can also add some trace elements and minerals. is very popular because of high nutritional value, delicious and convenience.